A golden foal, inside and out! 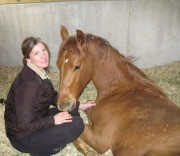 We are calling her Royal Gala – the name of a sweet apple “with red flushes, over a golden or cream coloured skin”. Furthermore, Gala is a bit of a party girl, so her name will hint at her outlook as well as her appearance! Refined and long-legged, with good shoulder angle, depth of chest, and correct straight legs, Royal Gala is showing extravagent movement powered by her great engine. 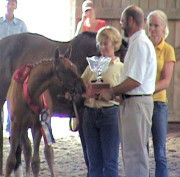 UPDATE: Gala – one of two foals I took to the German Hanoverian Inspection in Guelph Ontario – was selected Top Filly and Overall Champion Foal 2008. Dr Christmann commented on her good legs and frame, typiness, excellent front end and elastic movement. He called her “untouchable” at the trot. We are very proud of Gala and her homebred mother Contessa by Contendro, from SPS Ester. 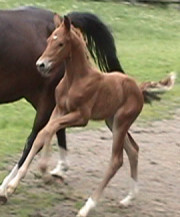 Her 2 foals have been Top Filly 2007, and Overall Champion Foal 2008. Way to go, darling Tess! SOLD to Kim and Jason in New Jersey, to join Sigi and Sobella Hit.